The creators of the legendary Monkey Island adventure games are back and decided to give us a new game that lives up to the memories that my generation has about these old games: Thimbleweed Park. In Thimbleweed Park you play five characters that have nothing in common but that at the same time are connected in ways they don’t know anything about. Even though the game begins as a murder mistery and with two Mulder & Sculley-like FBI agents that are supposed to solve a murder, the game game comes with all the weirdness and humor that you’d expect from a Ron Gilbert and Gary Winnick game. Thimbleweed Park is a fun ride and it lives up to the expectations that someone who grew up with LucasArts games involuntarily has. 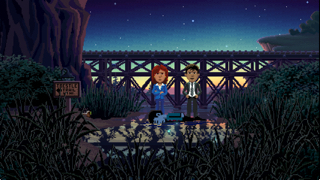 If LucasArts games were still around and would still be making adventure games, Thimbleweed Park would carry their brand label. But even without any nostalgia, the game easily stands on its own and delivers great adventure game entertainment. A note to the younger generation: No, it’s not a 3D game, no, it does not have action sequences and the graphics are intentionally pixelated the way they are — if you play through the game, you will find that there even is a logical reason for the pixelated graphics embedded in the story itself. It’s not just about selling a nostalgic experience to old farts like myself, it’s actually a deliberate design choice to underline certain points of the story. It took me roughly twenty hours to play through the adventure, so at EUR 19,99, that’s about a buck per hour of game play — which is an excellent value and worth every single cent. Although there is an Xbox One version of the game, I bought it for the PC on GOG, because I simply cannot imagine playing a point & click adventure with a controller instead of a mouse. The hardware requirements are extremely modest, and even my eight years old Dell XPS M1530 Core2Duo machine could easily handle it. So my guesstimate is that Thimbleweed Park will run on almost any machine out there that’s still working. Android and iOS versions will come later, and I think I will buy a copy for Android just to support the developers in the hope that they will make another game like this soon. Just visit www.thimbleweedpark.com for purchase links, more background info and even an interesting developer blog.